With $100 Million Afreximbank Commitment, Fund for Export Development in Africa (FEDA) Positions to Support African Businesses. 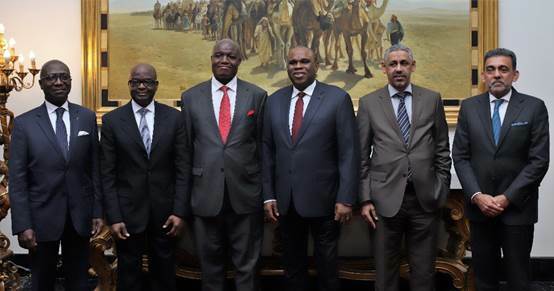 Prof. Benedict Oramah, Chairman, Board of Directors, FEDA, and President, Afreximbank (3rd right), with other Board members (L-R): Jean-Louis Ekra, former Afreximbank President; Dr. Deji Ali, Non-Executive Director, Asset and Resource Management Company Ltd.; Dr. Philip Kamau, CEO, FEDA; Dr. Sidi Ould Tah, Director- General, Arab Bank for Economic Development in Africa; and Vishwanathan Shanker, Partner and CEO, Gateway Partners, following their meeting in Cairo. Cairo, 03 Feb. 2019: – The operationalization of the newly-created Fund for Export Development in Africa (FEDA) moved into high gear today with the holding of the pre-incorporation meeting of the Board of Directors in Cairo. FEDA, a wholly-owned development-oriented subsidiary of the African Export-Import Bank (Afreximbank), has been set up to implement the Bank’s Equity Investment Programme by providing seed capital to companies in Afreximbank’s key focus sectors, including agri-business; manufacturing; consumer and retail; financial services; technology; travel and tourism; transport and logistics; and industrial parks. It will invest across all market segments but will have its greatest focus on small and medium-sized enterprises. The long-term objective of FEDA is the provision of equity capital and related financial, non-financial and support services to operators in Africa’s tradable and support sectors, with emphasis on activities that support intra-African trade and value-added exports. The Fund, which has been set up with an initial $100-million commitment, will also seek to leverage on the role Afreximbank has played in mobilising trade finance into Africa to also mobilise foreign direct investment (FDI) into the continent. Addressing the pre-incorporation meeting, Prof. Benedict Oramah, Chairman of the Board of Directors of FEDA and President of Afreximbank, said that the fund would expand Afreximbank’s offerings to include vital equity investments that would boost intra-African trade. Dr. Philip Kamau, Chief Executive Officer (CEO) of FEDA, said that a feasibility study conducted for Afreximbank had identified a funding gap which was inhibiting intra-African trade. FEDA had, therefore, been set up to provide equity and to leverage FDI to help close that gap. He announced that FEDA would start investment activities in 2019, with a target to invest $10 million during the year. It was also targeting to raise $450 million in FDI during the period. In addition to Prof. Oramah and Dr. Kamau, the other members of the Board of Directors are: Jean-Louis Ekra, former President of Afreximbank; Vishwanathan Shanker, Partner and CEO of the private equity fund Gateway Partners and former Board Member and CEO for Europe, Middle East, Africa and America at Standard Chartered Bank; Dr. Sidi Ould Tah, Director- General, Arab Bank for Economic Development in Africa; and Dr. Deji Ali, Non-Executive Director, Asset and Resource Management Company Ltd., Nigeria, which was named the Best Fund Manager in Nigeria in 2018. FEDA will be headquartered in Mauritius.